I’m not going to lie, I give both the yarn and the pattern 3 out of 5 stars. Maybe I was just having a rough month, but nothing came easy with these socks. First the yarn just wouldn’t cooperate. It became so severely tangled at one point that I had to cut out the knots. I spent my lunch break one day just trying to salvage as much of it as I could by untangling it. What a time! Then the pattern had some issues. I swear that there is an error in Rnd 1 of the leg. This is okay. Mistakes happen. Lord knows I’ve made my own mistakes. But it was frustrating to try to figure out what was wrong. It seems that for a size 9 sock, you should have 53 stitches to start the leg work, not 49, in order for the chevron stitch pattern to line up. But what an amazing sock it turned out to be. The yarn worked its magic into vertical stripes on the leg. This seemed so unusual. Is this something that Knit Picks designed it to do? Have you ever had this happen with your socks? The biggest discovery I made with this toe-up sock was how to tell where to end the leg on the first sock so that you’ll have enough yarn to make the second sock the same length. 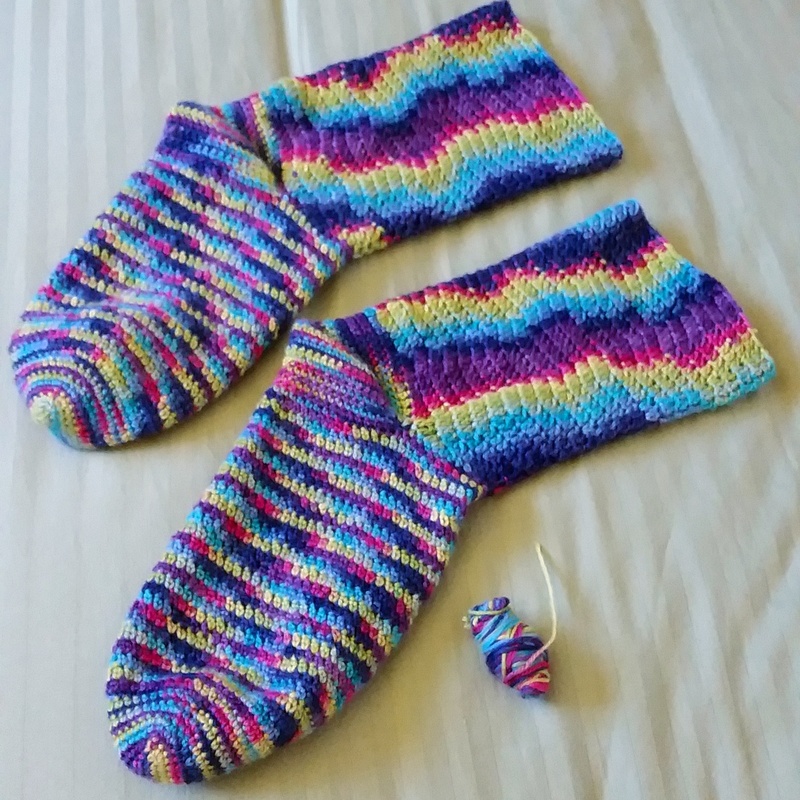 All you have to do is weigh the sock against the remaining yarn and fasten off your sock when you get to the point where they both weigh the same. For this sock, I only had a wee little bit of yarn leftover (that little ball in the above photo). It’s so satisfying to make use of almost a whole skein and not have a bunch of yarn left at the end. I’m finding this to be one of the big benefits of toe-up socks. I always get a little anxious when working on cuff-down socks because I’m afraid that I will run out of yarn. So despite all the frustration that this month’s sock caused, in the end I am pleased with the result. 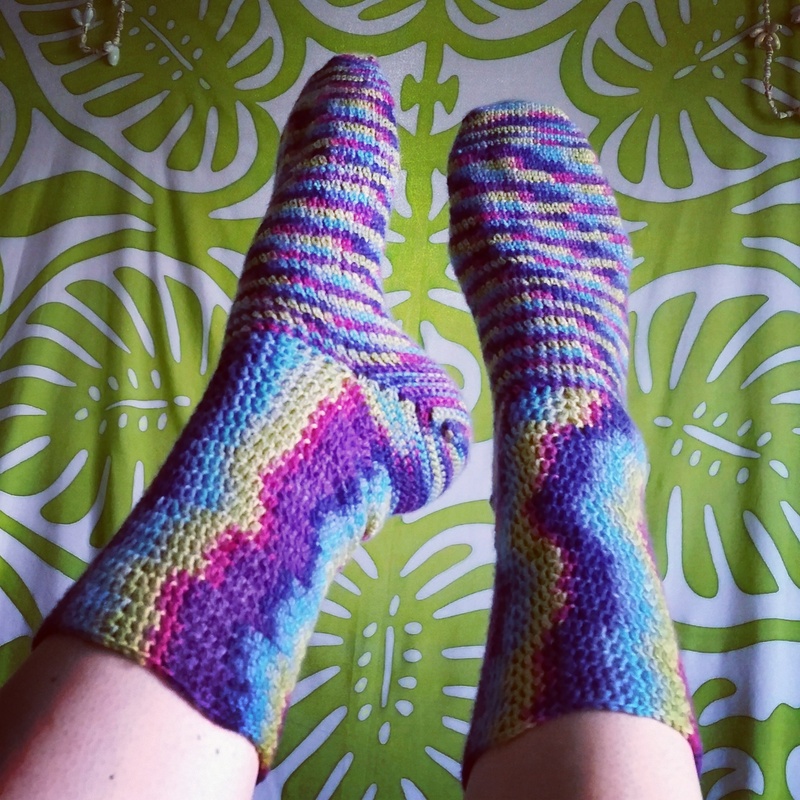 Here’s to an easy-breezy sock for May. Wish me luck! I’ve never seen a self-striping yarn do vertical stripes. I was wondering if you crocheted the leg part side to side (although I wasn’t sure how you would do that!). Also curious about the short row heel: are crochet short rows like knitted ones? Didn’t occur to me that you could do that. Hi Kit! I love your questions. First, I did the leg in the round, but it was with a chevron stitch pattern. I’ve experimented with chevrons and variegated yarn before. Sometimes the combination can do some really unexpected things. But I’ve never seen vertical stripes like this before! A crochet short-row heel is a lot like in knitting, but in crochet you pick up the side stitches one at a time. These side stitches are created by leaving the last stitch in a row unworked as you are creating the heel flap. Then, when it’s time to finish the heel, you’ll crochet across to the end of a row and sc and slst in the skipped stitch at the end of the row below. Then you’ll turn and do the same thing on the other side, repeating until there are no more skipped stitches left and you can begin crocheting the leg. Pretty nifty, huh? 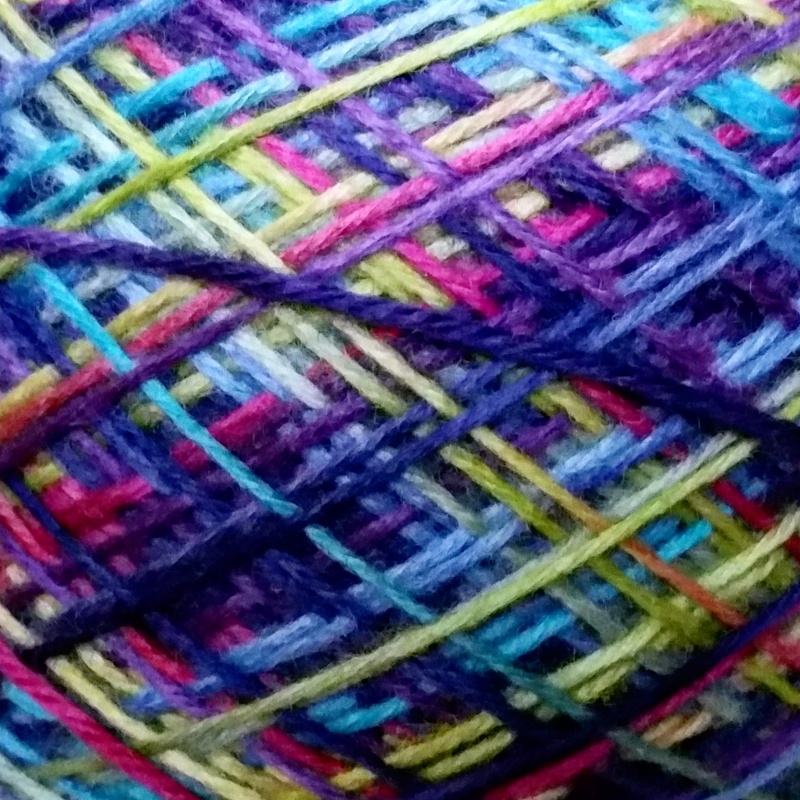 I dislike kitchener stitch too, mostly because it evades memory. I know that I know how to do it, but I have to look it up and take it painfully slow every time! Thanks for your detailed reply. I’ve never done chevron stitch. I’ll have to try it. Sometimes the stitch pattern can really play havoc with the color pattern. And I think I understand what you’re saying about crocheted short rows, too. Thanks! That’s true. I hadn’t thought about all the other uses for Kitchener stitch! I’ll just have to practice.